We got a tip that that Nvidia P102-100 GPUs are starting to hit the market and they are going to be interesting for miners similar to the P104-100 as they are offering a custom configuration for the memory and faster performance, unlike their desktop GeForce counterparts. 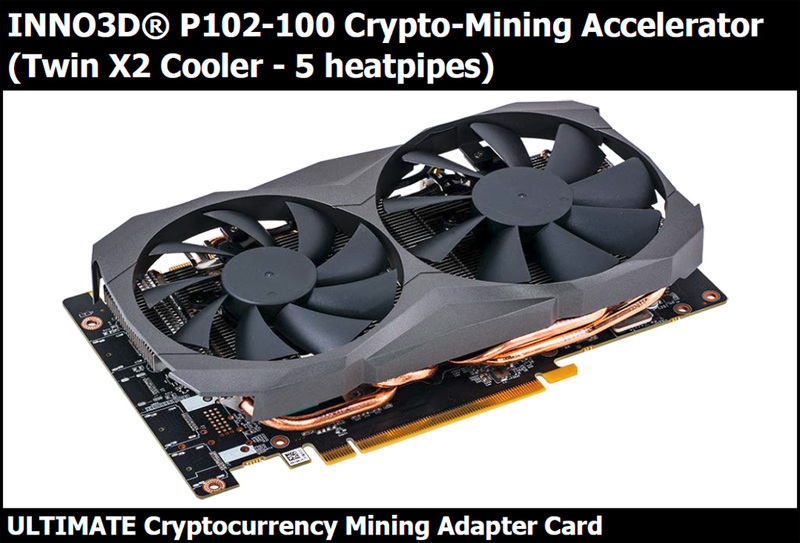 We got information about an Inno3D P102-100 GPU and the specifications of the mining card as well as some preliminary performance results coming from the manufacturer, so if you are interested you can check out the specs and hashrates below. Unfortunately the initial photos of the Inno3D mining GPU show that there are no video output connectors (kind of expected for a mining GPU), but there is also no backplane for attaching the video card to a mining frame or a case easily and that is more of a problem (though they mention Standard PC Bracket as an accessory?). Gigabyte did that thing back when they released the first revision of their Nvidia P106-100 Mining GPU, but later on they have added a backplane in the next revisions. The hashrates cited are from Inno3D directly and are for reference only, there is no mention if these are at stock frequency or after overclock or any user optimizations (could they be stock?). Judging from the number it seems that the new P102-100 GPUs are optimized and will be great for mining Ethash coins, but not that good for others compared to what you can get from a GTX 1080 Ti as a comparison. We do hope that soon we will be able to do a detailed review and have some firsthand performance numbers for the P102-100 mining GPUs, but for now it is only what we are getting from manufacturer specifications. Another very important thing is the pricing of these new GPUs, but unfortunately at the current market conditions we do not expect to find them that much cheaper than what a GTX 1080 Ti goes for.